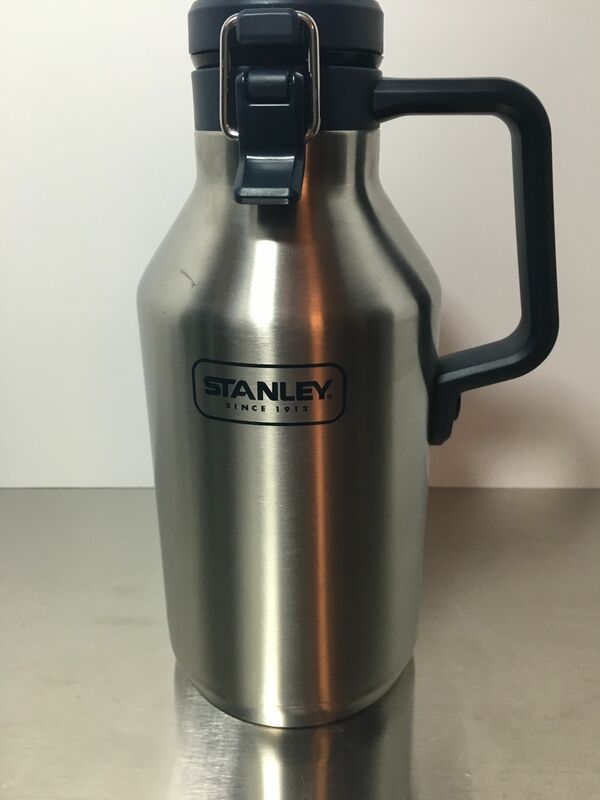 Stanley’s Stainless Steel vacuum insulated growler features vacuum insulated body and foam insulated lid to keep beer cold for 16 hours. 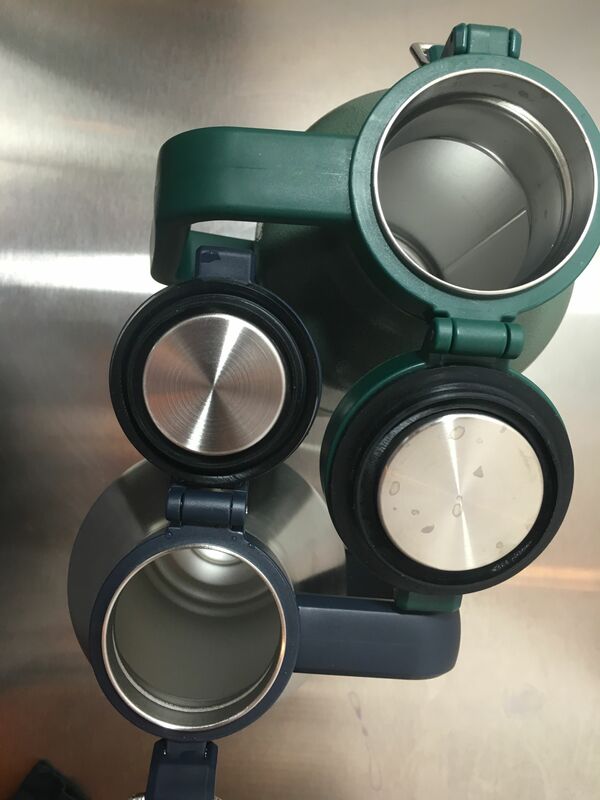 Made of 18/8 stainless steel and BPA free. 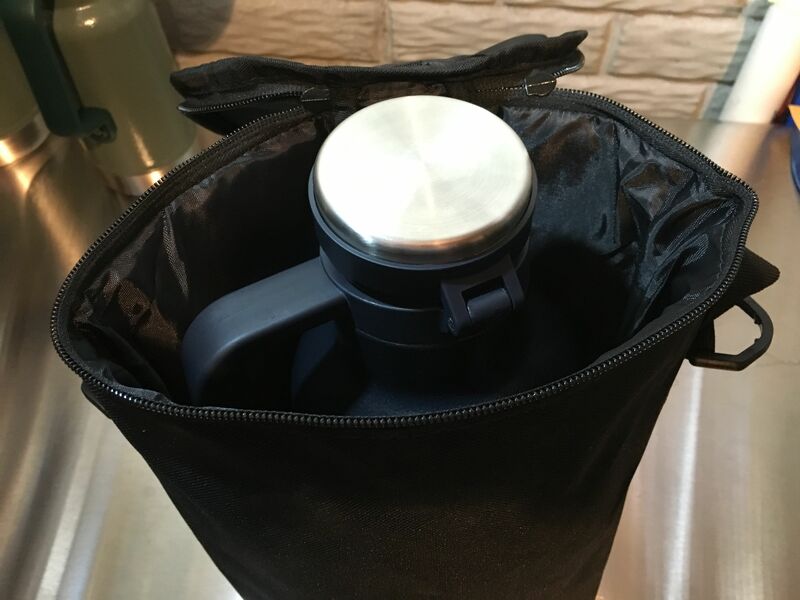 The heavy duty handle makes it easy to carry and allows you to pour smoothly with one hand. 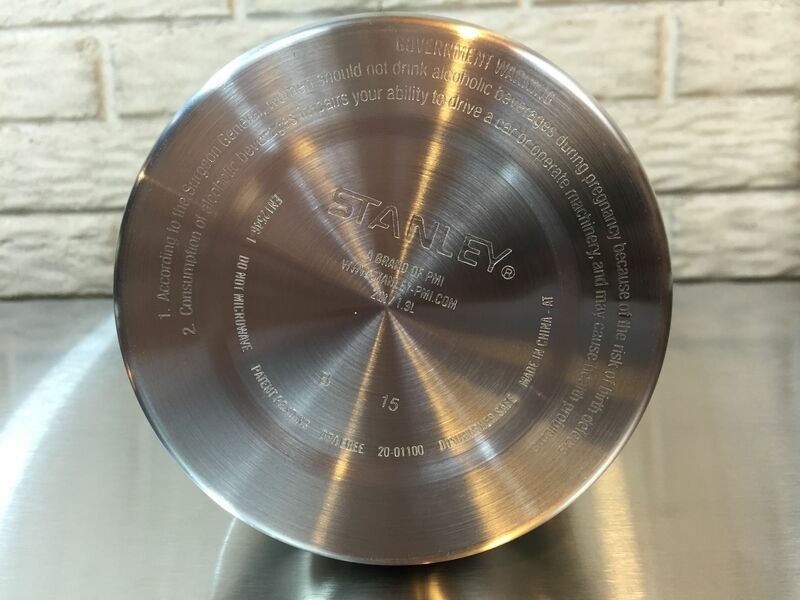 Steel inner lid means no plastic is in contact with your beer. 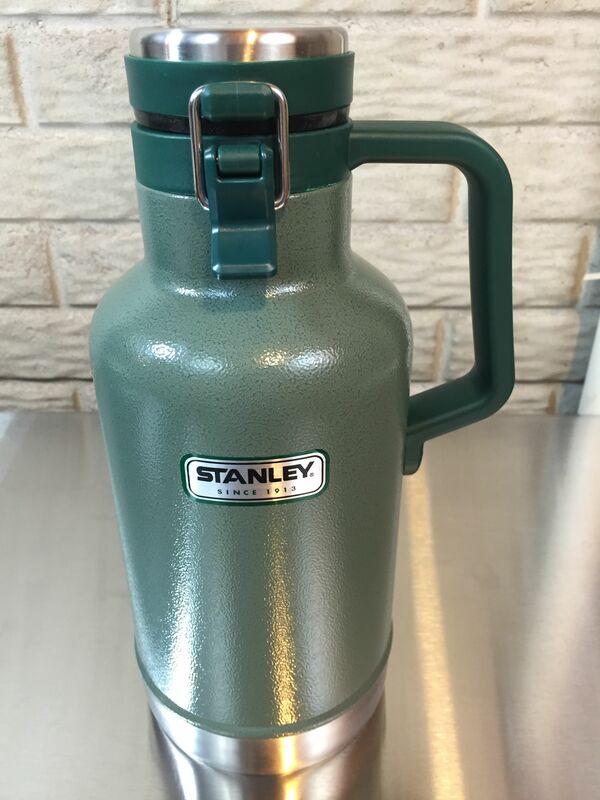 It’s available in Hammertone Green and Hammertone Navy in 64 ounce/2 Quart/Half Gallon capacity as well as in a smaller 32 oz size. It’s also part of a Gift Pack Set that includes the growler along with stacking pints. 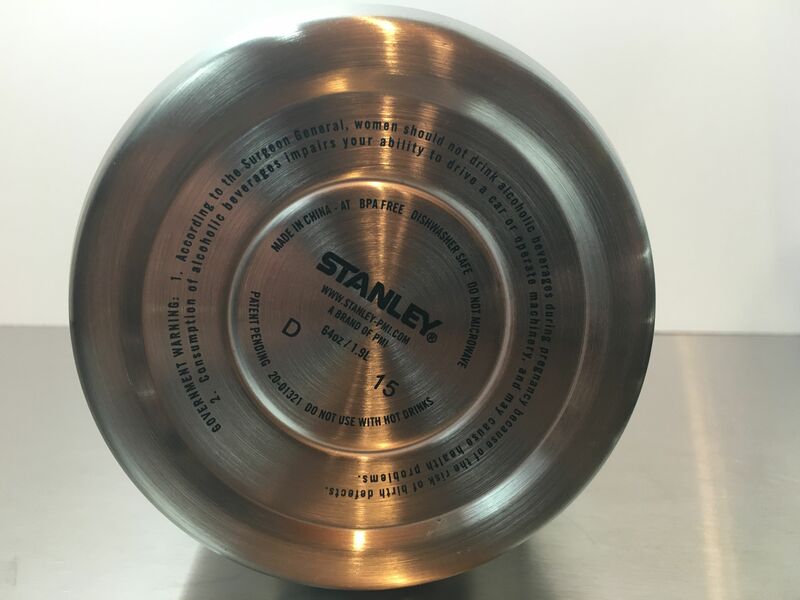 Stanley makes a non-insulated version version as well. 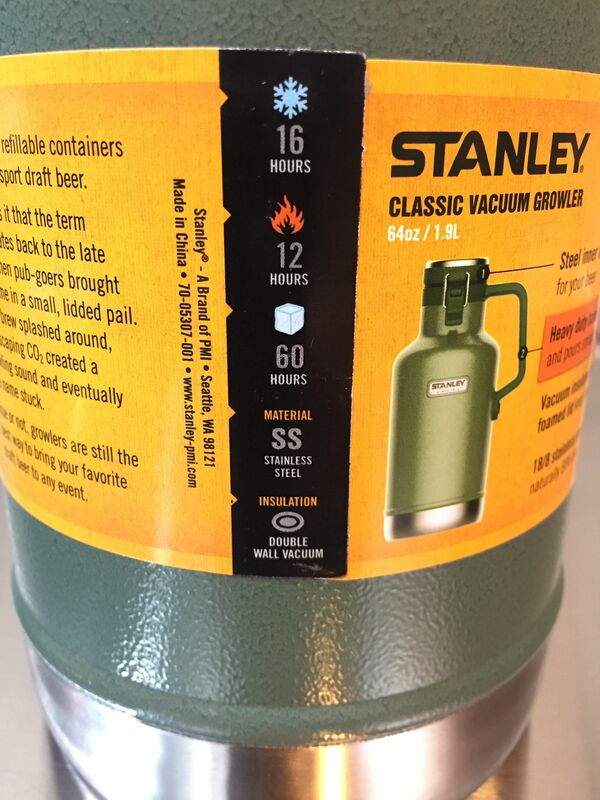 The 64 ounce variant is mentioned in this review, although it comes in 32 ounce as well. 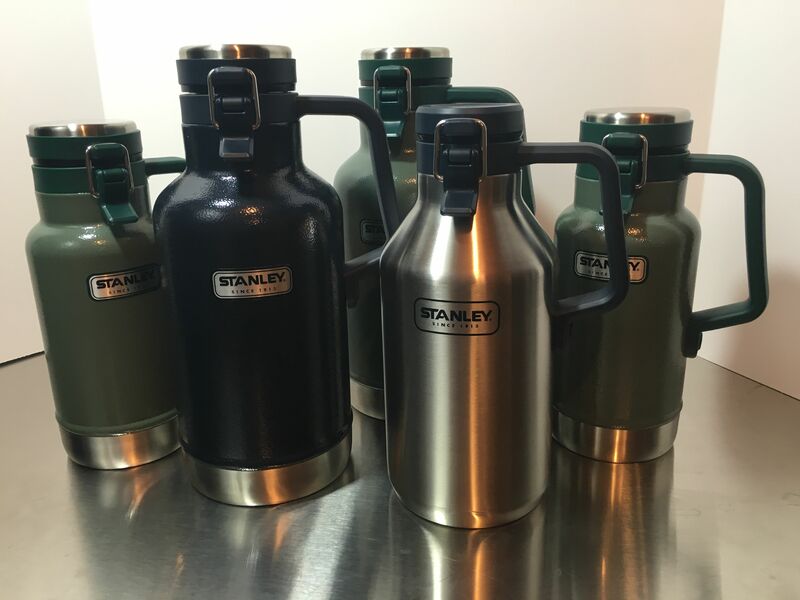 Note: When you look at the number of growlers and amount of Stanley PMI gear that I have, you may think to yourself… Homebrew Finds is an amazing website with tons of awesome readers (stop guys, I’m blushing!) 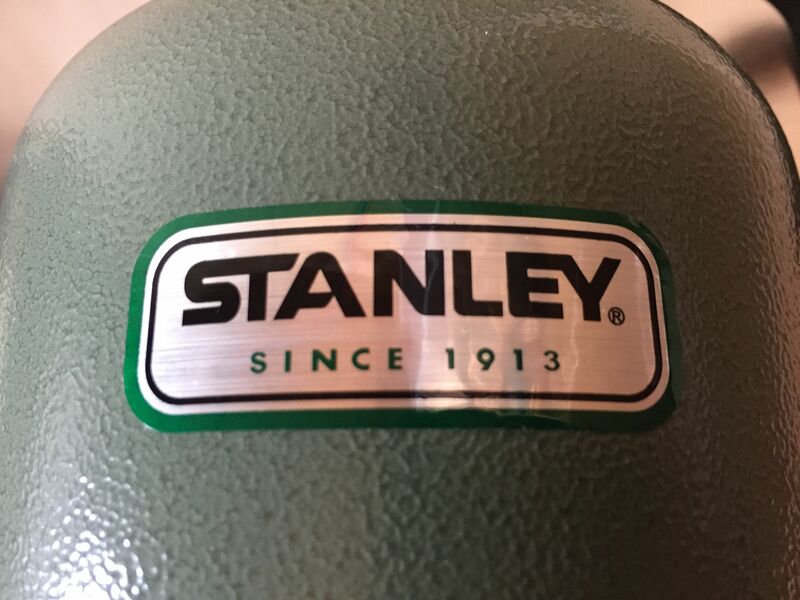 and Stanley sent me a bunch of freebies to review. Rest assured, I bought every single piece gear that’s featured here. In fact, I bought more than one in some cases. That’s a testament to how much I like it. 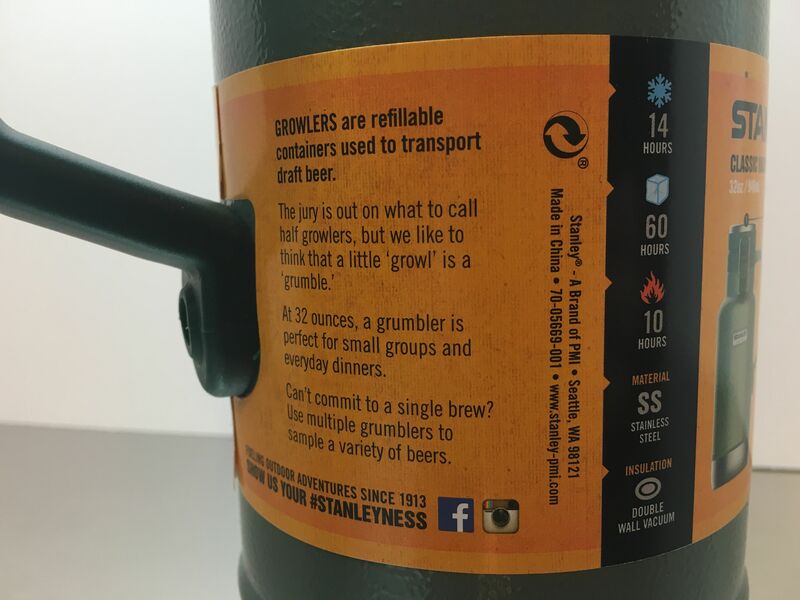 If you are unaware about the how-tos, wheres and whys of using a growler… sit back and learn kids. This product label is going to run you through it all. 🙂 This particular panel highlights a good feature, you can pour this growler smoothly with one hand. 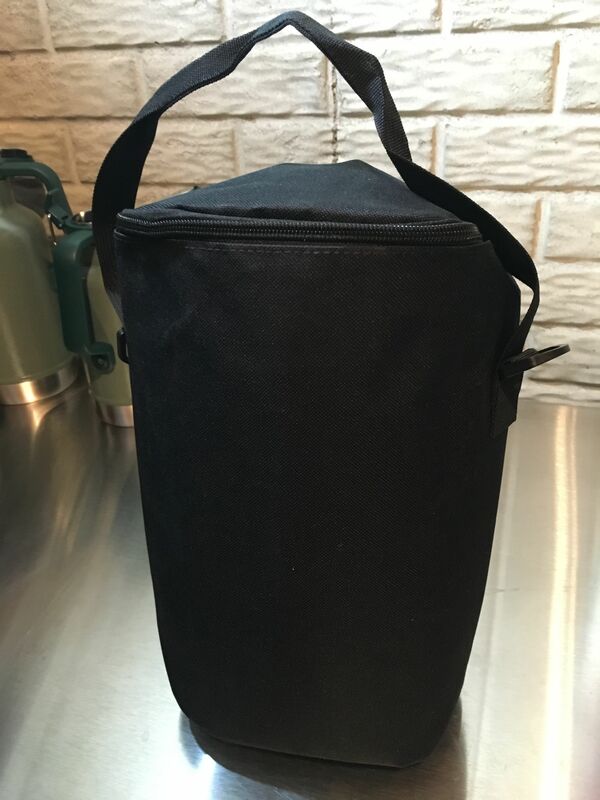 This panel highlights more features – Steel inner lid – no plastic contact for your beer – Heavy duty handle is easy to carry and pours smooth with one hand – vacuum insulated body and foamed lid keep beer cold for 16 hours – 18/8 stainless steel won’t rust and is naturally BPA free. 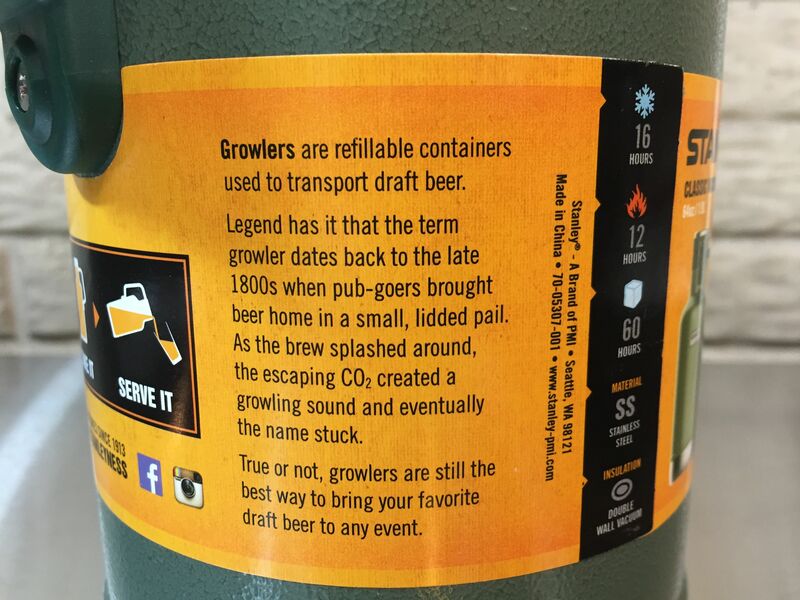 As I mentioned this growler label is all about letting you know about about growlers! Here’s a diagram of how the total process works. 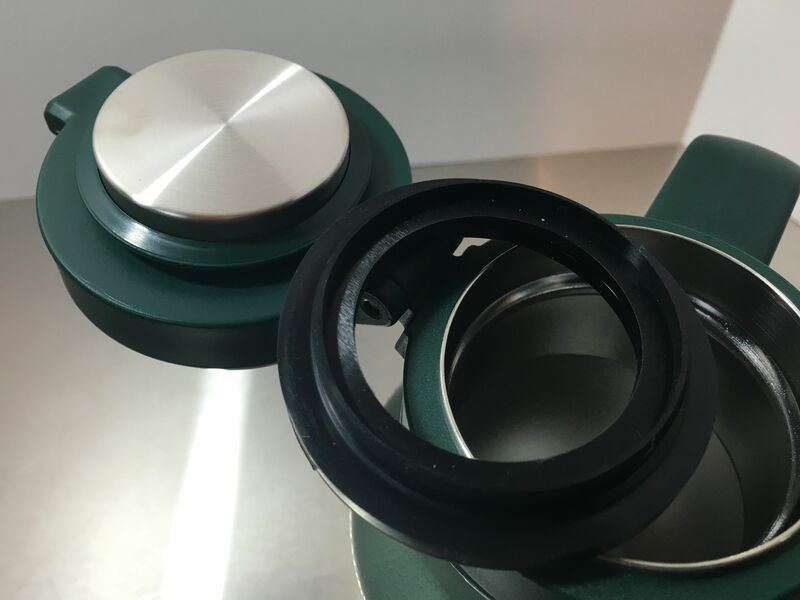 A look at the bottom. 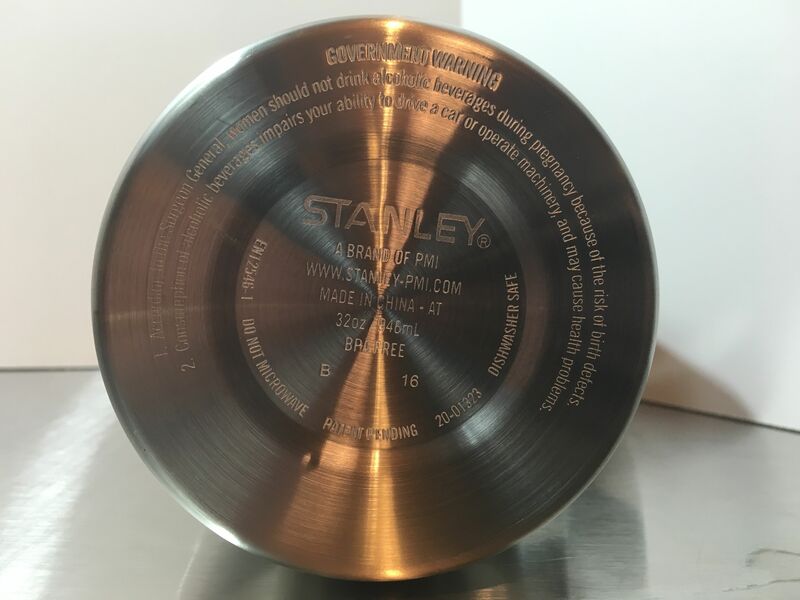 It displays a printed government warning. That may be handy depending on the growler laws of your state. 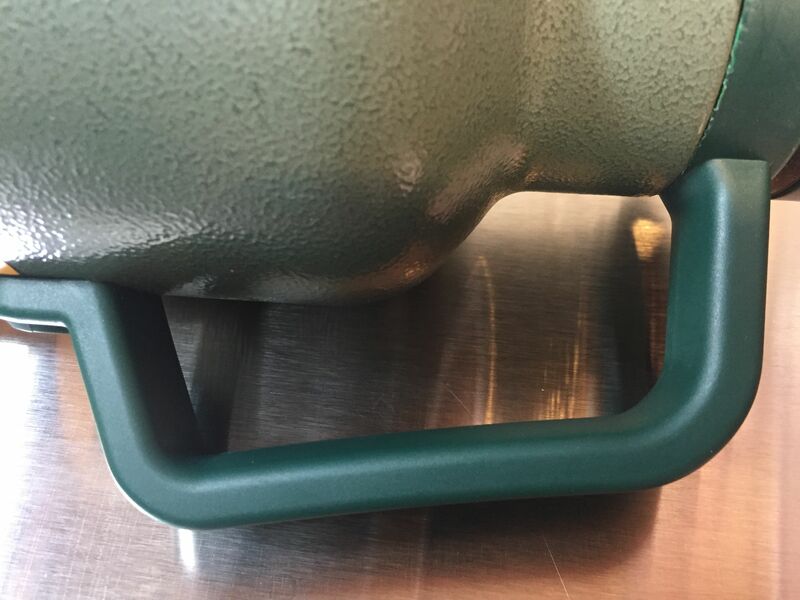 A look at the handle. It is solid and well built. 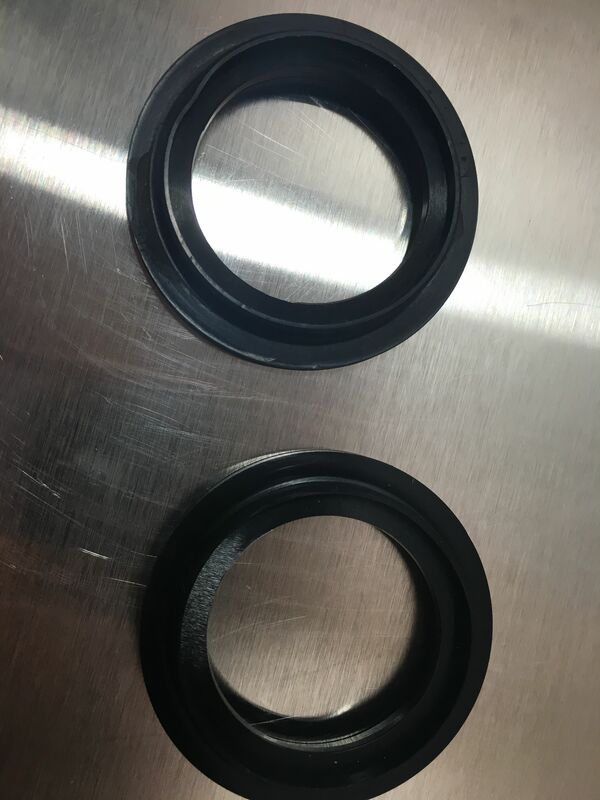 Here are gaskets from both the 32 ounce and 64 ounce sizes. They appear to be identical. The uninsulated version is smaller the in the insulated version. That’s also true of the opening. 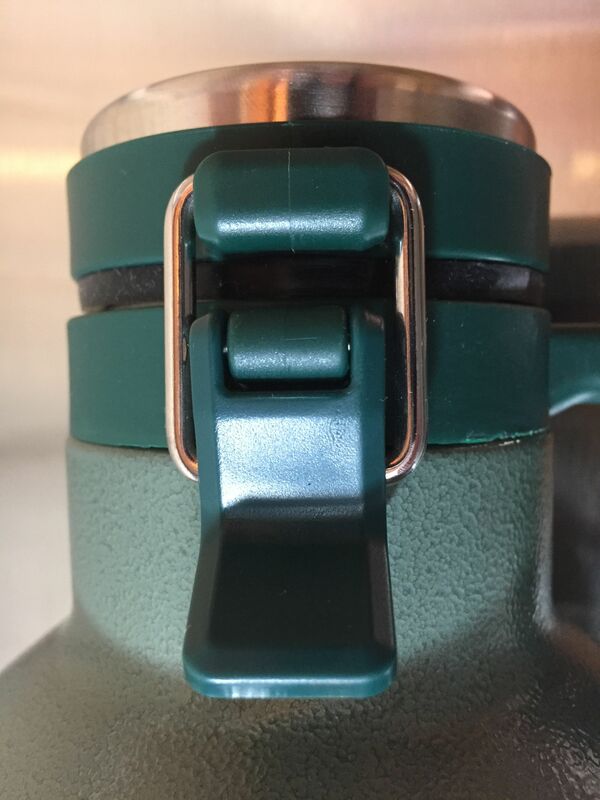 You can see the the uninsulated growler has a smaller lid and opening in comparison. 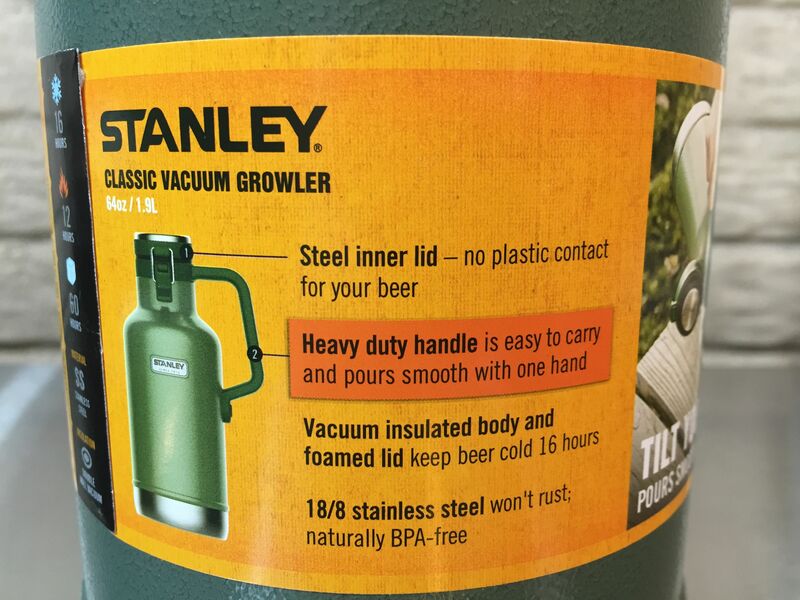 These growlers are extremely well made and well thought out. One of the the cool features is that these are designed for one handed use. 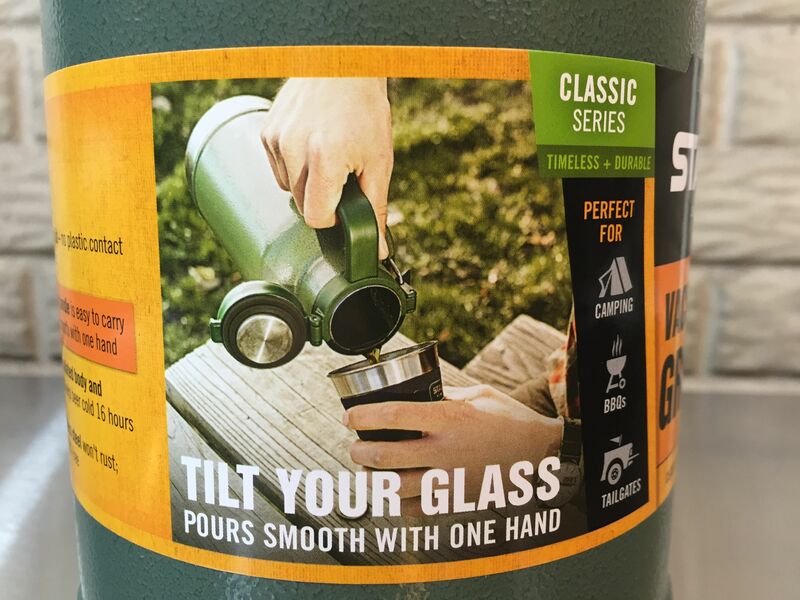 That means you shouldn’t have to hold the lid open when you pour a beer. 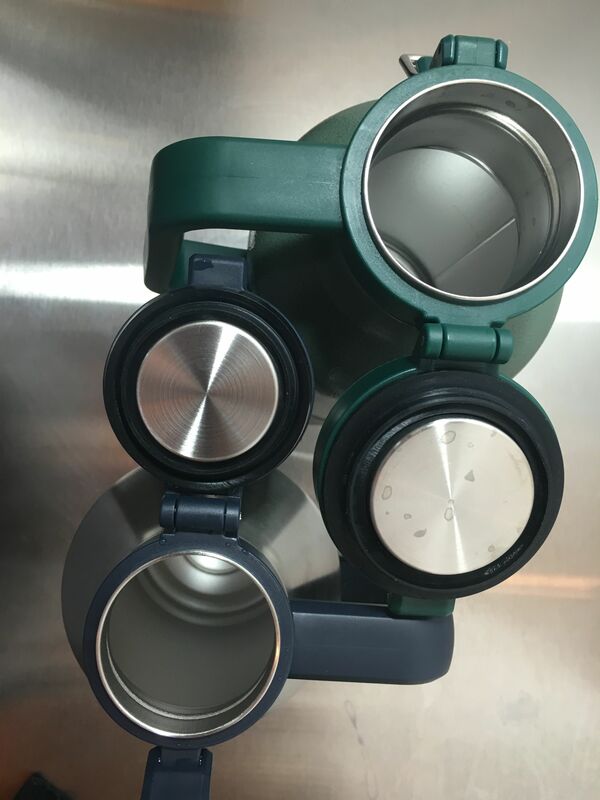 As you can see, all variations have lids designed to support themselves when fully opened. One of the great things about double walled, vacuum sealed growlers is their ability to insulate contents (typically both hot and cold) well. I put that to the test on a hot summer day and here are the results. 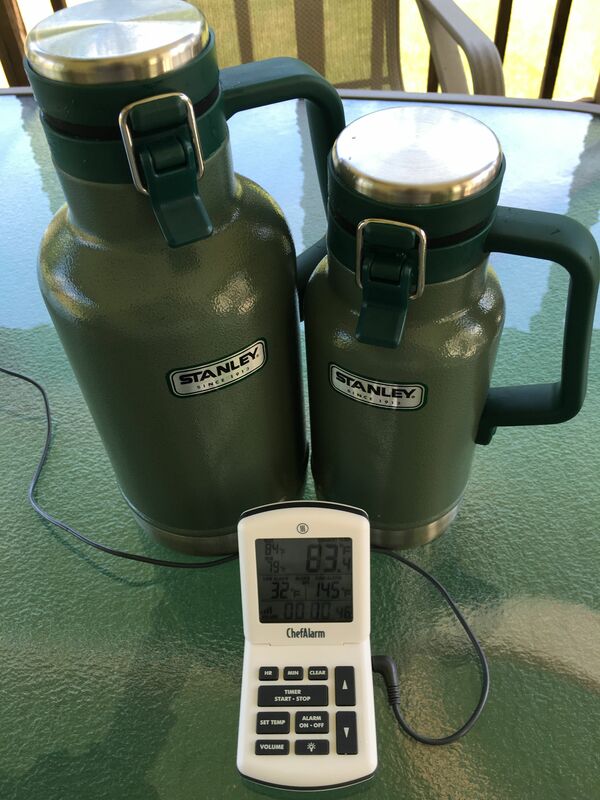 I placed both the 64 and 32 ounce growlers outside on a hot summer day. 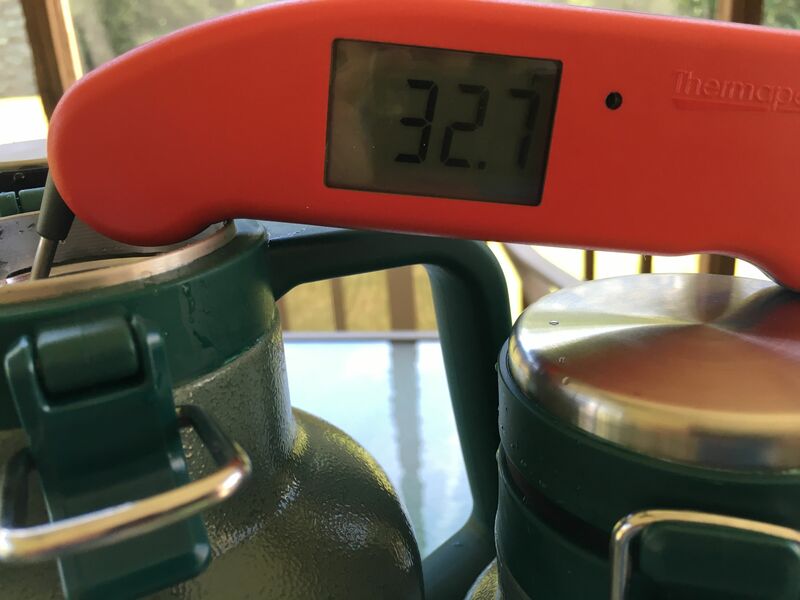 The starting temperature was 83.4 deg F. I filled each growler with cold water and let them set for a bit to equalize. 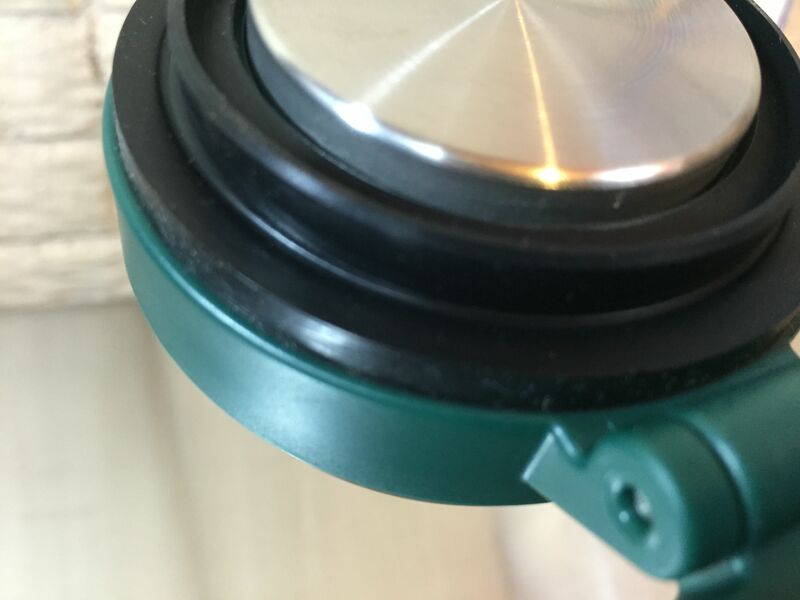 I’m using my ThermoWorks ChefAlarm [Review] to measure ambient temp and time. 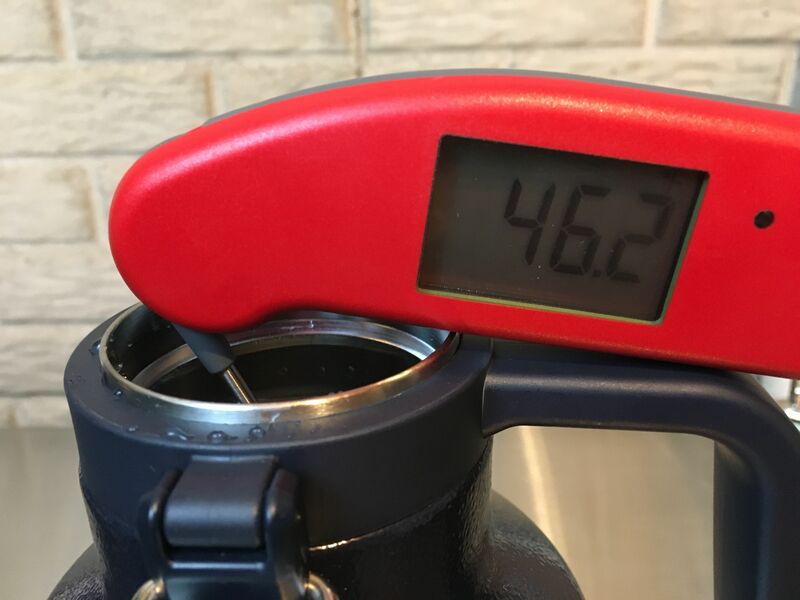 My ThermoWorks Thermapen Mk4 Thermometer shows the 64 ounce size at 32.7 deg F.
Most of the time, we’re probably not going to leave a growler full of beer sitting outside for hours and hours on an 80+ degree day. 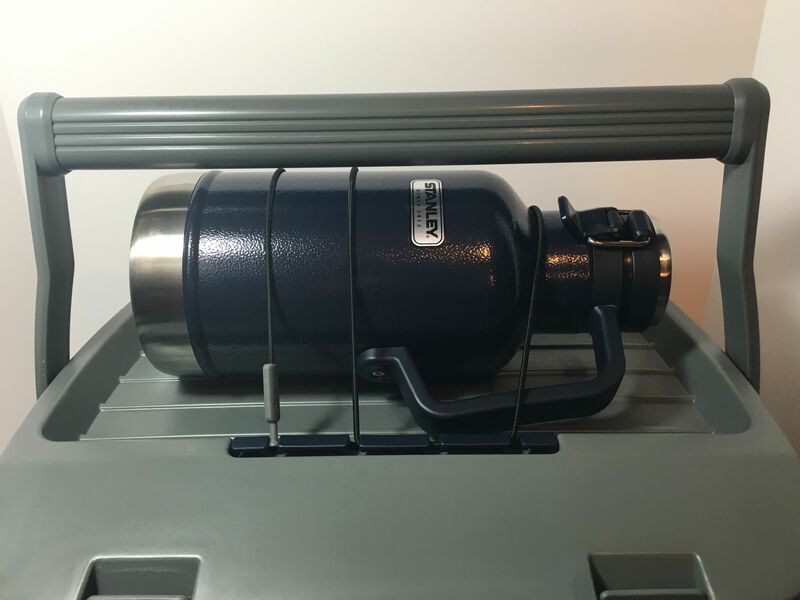 For a more realistic test, I also placed a growler inside. 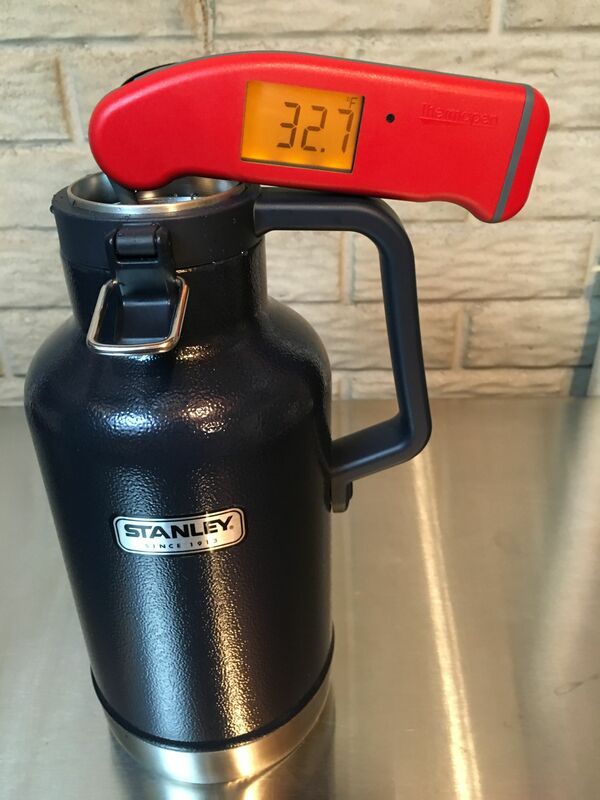 The ambient temp (in my basement) is about 68 to 70 deg F. The starting temperature for this growler was 32.7 deg F.
Results Outside Growlers: The outside growlers performed marvelously considering the were subjected to higher temperatures for hours. In the first 5 hours the 64 ounce size lost a scant 1.2 deg F per hour. While the 32 ounce size lost 1.98 per hour. That makes sense, considering the lower overall mass of that container. After 19 hours the 64 ounce size had lost 12.1 degrees or just .64 deg F per hour. Clocking in at a still chilly 44.8 deg F. These are great results! Results Inside Growler: The 64 Ounce Growler that was kept inside fared even better. I took two additional readings on this growler, conducting the test for a total of 29 hours. 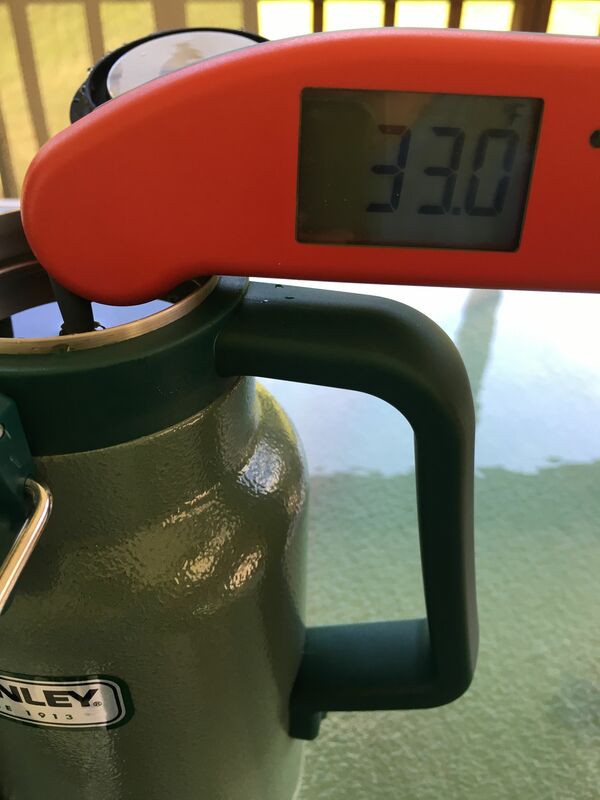 This growler lost only 3.3 deg F in the first 5 hours and only 13.5 deg F in… 29 hours. 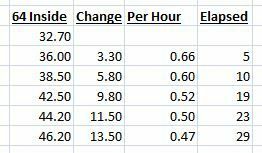 That averages to just .47 deg F per hour loss. That’s amazing! Final reading at 29 hours on the growler I kept inside. 46.2 deg F. A loss of .47 degrees per hour over the span of 29 hours. 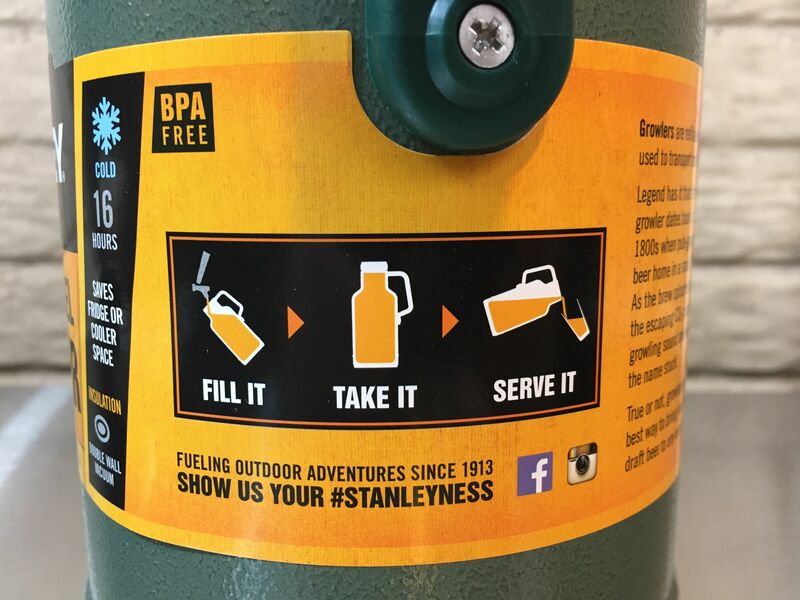 I have Stanley’s the 16 Quart Adventure Cooler as well. 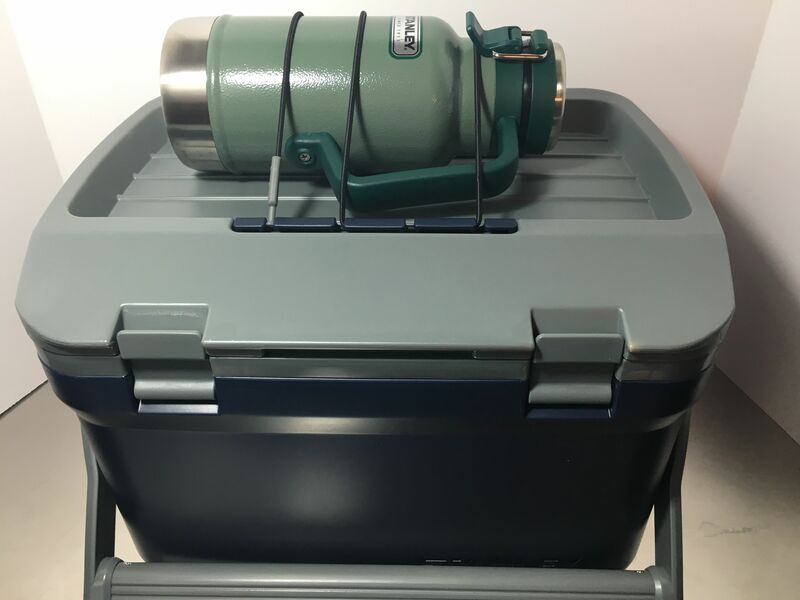 That cooler features an adjustable tie down. It easily fits the 32 ounce growler. The 64 ounce size also fits in the tie down and the handle clears the bottle. Zipped up. 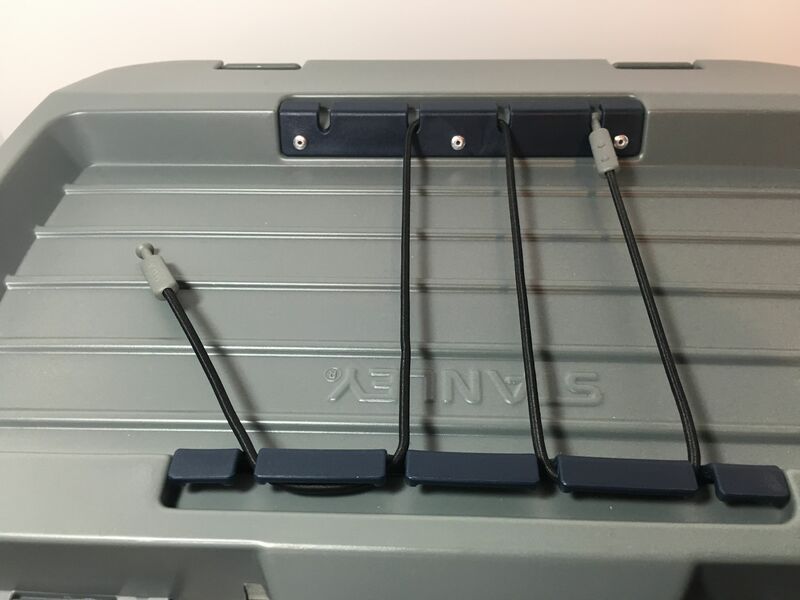 This carrier provides additional insulation and protection. 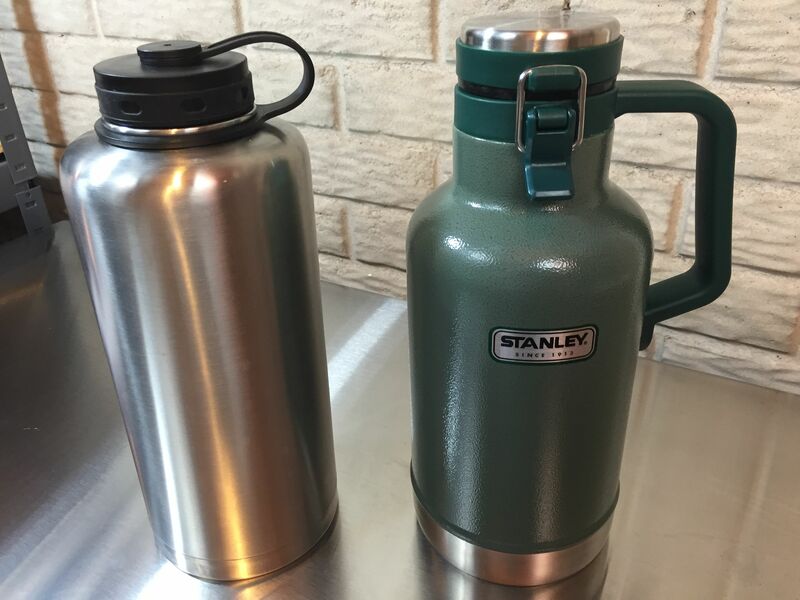 My Stanley PMI Gear… 16 Quart Adventure Cooler, 64 ounce insulated growlers (in both Hammertone Navy and Hammertone Green), 32 ounce insulated growler in Hammertone Green [Two of These], Stainless Steel Flask, Nesting Containers and Stanley Adventure Camp Cook Set [Not pictured] and their 64 oz non-insulated growler. 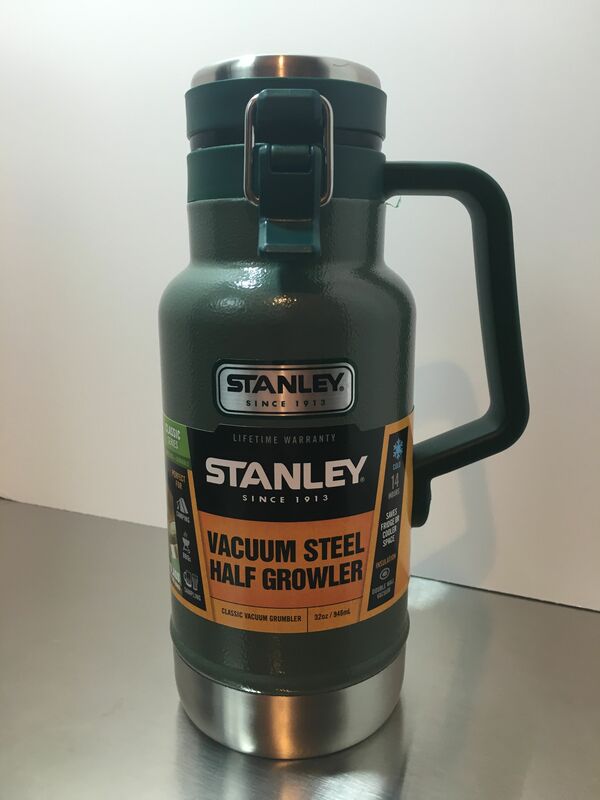 Stanley’s Classic Vacuum Insulated Growlers are well thought out and well built. As a child of the 70s I also love the styling of these growlers. 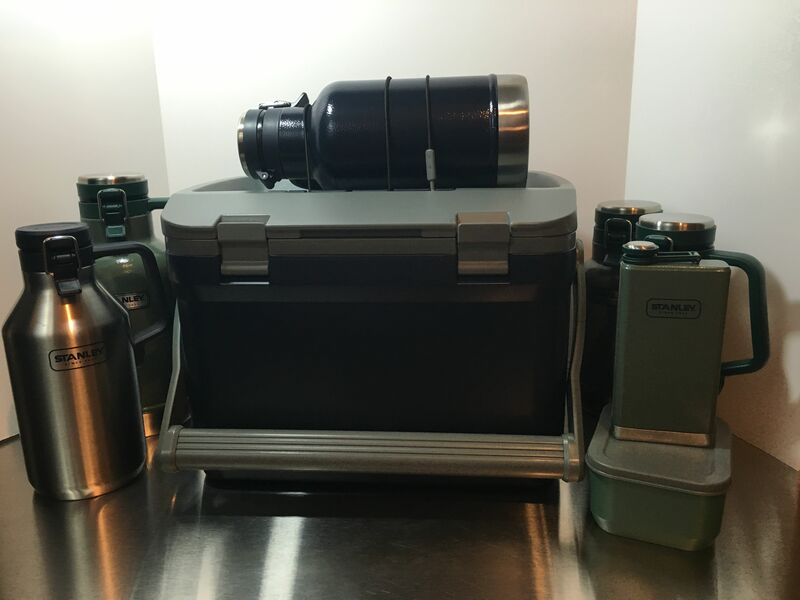 It takes me back to my Dad’s Stanley lunch box and our family’s metal Coleman cooler. 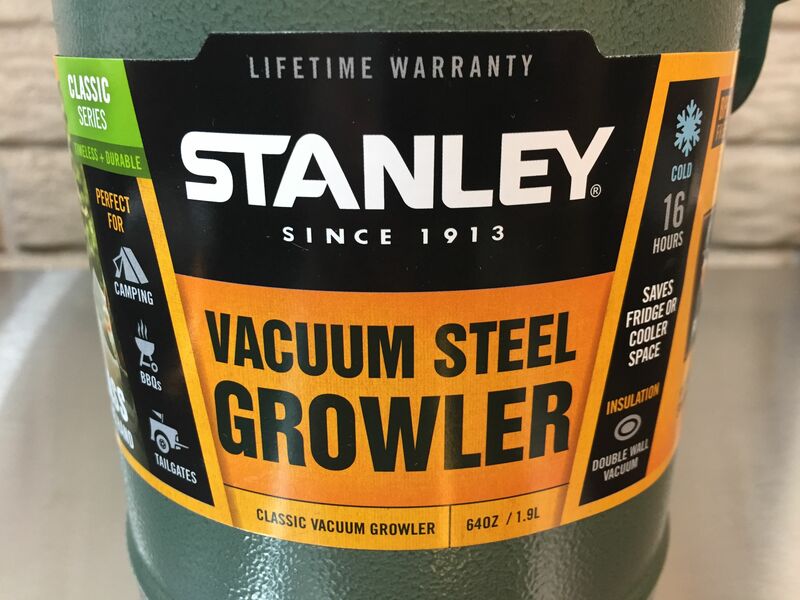 I purchased my first Stanley Classic Vacuum Insulated growler back in October of 2015 and, in relatively short order, purchased more. 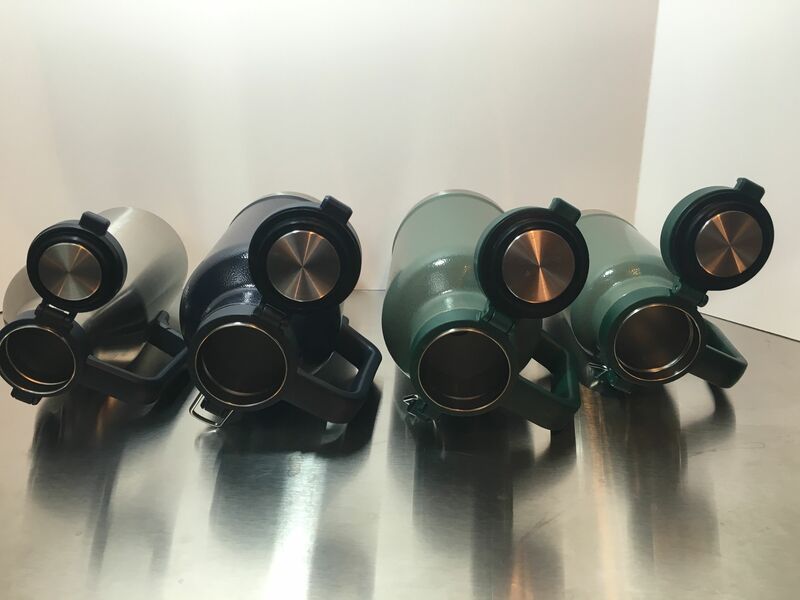 These are amazing growlers that I can confidently recommend them to you. This entry was posted in Amazon, Draft, Featured Reviews, Growlers, Portable Serving, Reviews, Reviews & Top Posts on June 27, 2016 by admin.